Daniel executes a right leg tap, followed by a right jab. But before he can continue, George fells him onto the ground. Daniel's sequence is like Muay Thai Sequence F except that the left and right modes are reverse. Andy's attacks are similar to Daniel, which is Sequence F with the left and right modes reverse. Steve brushes away the attacks, strikes the opponent's ribs, then fells him onto the ground. Once you are familiar with how a Muay Thai fighter attacks, it is not difficult to handle him. Andy and Steve go over the attacks and counters again. One may argue that an opponent's attacks may not necessarily follow the sequences shown here. Nevertheless, once you are familiar with the basic sequences, you can effective made modifications to handle any attacks. Here Steve does not follow an established sequence as he attacks. Yet, Andy can counter him effective because being familiar with the basic sequences Andy can respond spontaneously and correctly. Again Steve attacks randomly. Andy can respond spontaneously and correctly as Steve's attacks resemble Sequences F and G. In other words, being familiar with Sequences F and G, Andy merely makes modifications when an opponent attacks in a similar way. Dr Damian attacks ferociously and at random. Chris first brushes off the attacks to assess the opponent. 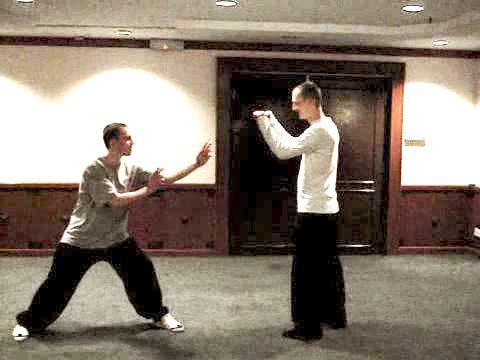 When the opponent attacks again in a similar way, Chris can more easily break the opponent's arm and fell him onto the ground. The roles are now reverse. Chris attacks with two log kicks, followed by an elbow strike. Dr Damian lets the opponent completes his series of attacks, then fell him onto the ground. Here Adam uses a different tactic than the one by Dr Damian shown in the previous video. Dr Damian lets the opponent complete his series of attacks, then counters. Adam moves in to counter as soon as the opponent attacks. The size of the video clip is 0.55 mb. 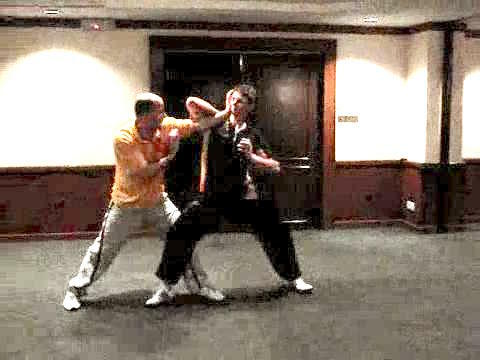 Responding to Muay Thai Attacks Spontaneously and Correctly with Shaolin Kungfu from Wong Kiew Kit on Vimeo.